Last week I was browsing through the Richmond Archives online trying to find Christmas-y photos of Richmond past. I didn’t know what I was looking for exactly, but I was hoping to uncover a photo of the Santa Claus parade in Steveston in the early-mid 80s, or a public Christmas tree lighting back in the 60s. Perhaps even Christmas decorations throughout Richmond when canneries were still de rigueur. But as it turned out, there were no photos like that in their archives. After performing some other creative Google and Flickr searches (you never know! ), I was reminded of the Gulf of Georgia Cannery National Historic Site’s blog. They’re active on their blog, posting stories, events, photos, and historical tales every week and I figure I’d dig around there. Little did I expect to find the jackpot with their Historic Photo Database! In the summer of 2010 we digitized our entire historic photo collection. Over 5,000 images depicting early Steveston and its residents, canneries along BC’s coast, including the Gulf of Georgia Cannery, and the trials and blessings of the west coast fishery are now available for viewing by the public for the very first time! An aerial shot of the B.C. Packer’s Imperial Plant on October 21, 1950. Recognize this? Look carefully at the roads and the bend of the railway. This is where the new condos are now located at the southern foot of No. 1 Road. You can see Moncton Street running parallel about a block behind the cannery. You can also see the Interurban Tram line (which is now a trail) and the farmland existing where the Steveston Community Centre and subdivisions now exist. The roads/trails have remained somewhat the same, but the land use and density has certainly changed over the past 62 years! 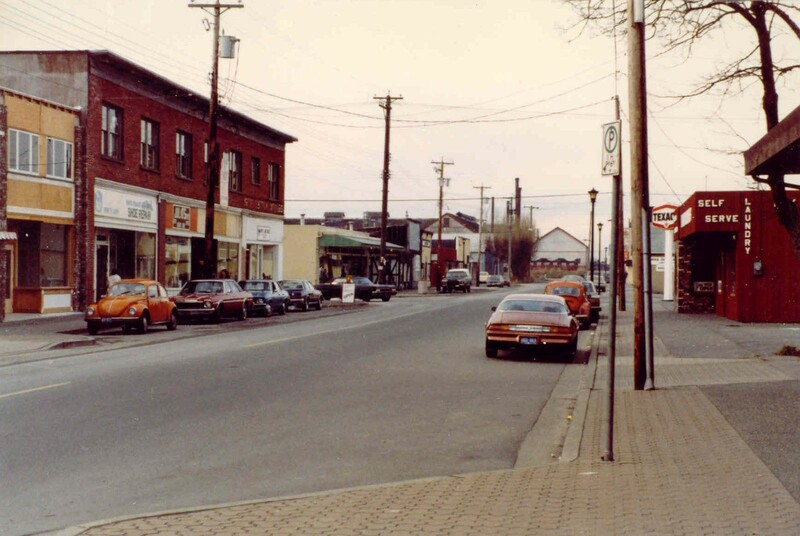 Steveston’s Moncton Street in the early 1980s. 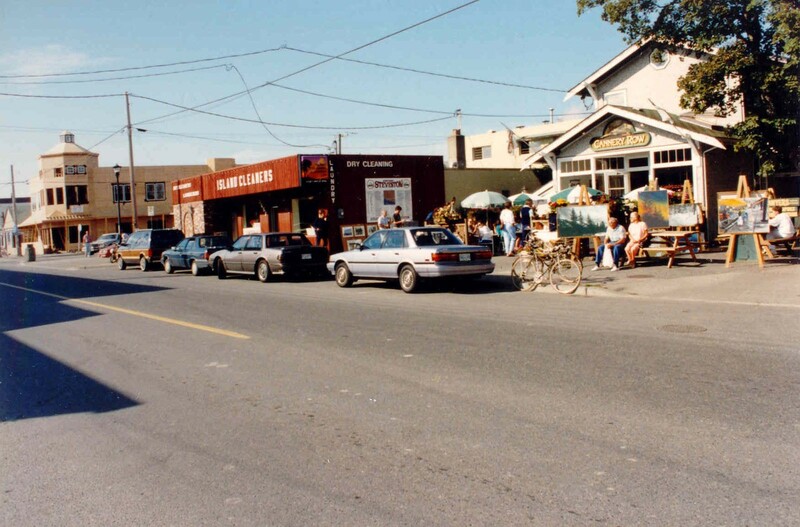 This is the scene of my earliest memories, standing right there on that sidewalk watching the Steveston Salmon Festival Parade going by, chasing my Dad down the street (who was in the parade with CiSL Radio at the time). I must have been two. Every year though, my family – parents, sister, aunts, uncles, cousins, grandfather – stands right here to watch the parade every July 1st. My grandparents, my Baba & Dido, (Gabe & Marg Martyniuk) owned and operated Island Cleaners. They were probably the first dry cleaning business to open in Richmond in the 1950s, if not one of the first in Metro Vancouver. They used to dry clean the linens for the airlines at the airport. Apparently there’s a story where they dry cleaned the stage costumes for the Rolling Stones when they were in town. Also, it’s interesting to see a Texaco sign. It confirms what I always expected: Texaco did exist in Canada in the early 80s. It doesn’t seem to anymore, at least not here in BC. You know how your earliest memories are fuzzy and you can’t remember if things are a dream or reality? I have early memories of seeing Texaco signs, and this confirms it. 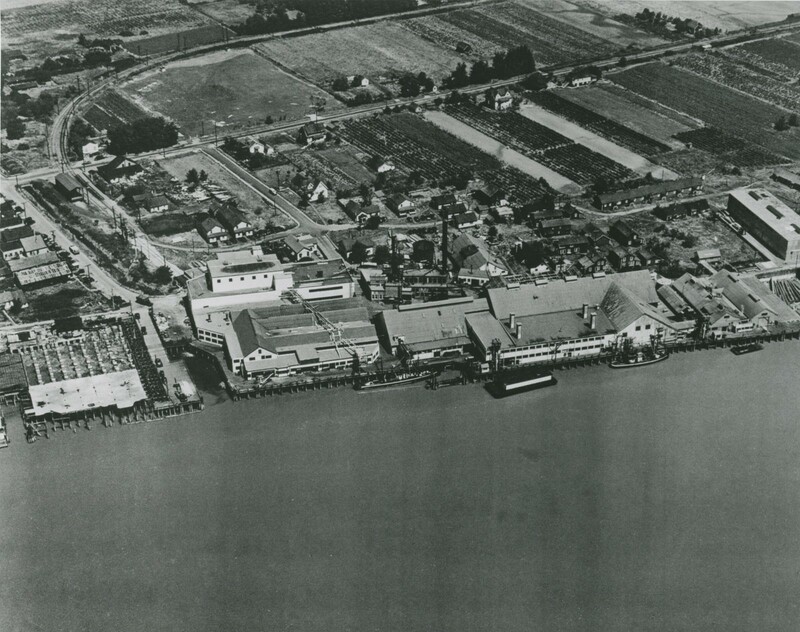 Other tidbits of info: The Gulf of Georgia Cannery was still operating as a cannery, and the Steveston Marine & Hardware Store was open for business and probably looks exactly the same (which is a good thing). Cannery Row Cafe in the mid-1980s. My uncle Ray Martyniuk originally opened Cannery Row Cafe in the early 1980s after being inspired by the cafe scene in San Francisco at the time. This was one of the first restaurants to have a proper espresso machine and a build-your-own sandwich bar. They had a neon sign that advertised cappuccinos, a rarity in the pre-Starbucks era. People went up to the counter to order their food, and they’d get it served at their table. The concept hasn’t changed, despite it changing ownership at least two times since. While my uncle founded and originally owned the business, my grandparents owned the building and I think it’s still in the family. I don’t know how this happened. All I know is that prior to it being a cafe, it was River Radio, an audiovisual fix-it shop located in a former cannery bunkhouse. It’s one of the oldest buildings in all of Steveston. The original name of the cafe comes from both the Steinbeck novel and Steveston’s old moniker, as once upon a time, Steveston had a dozen or so canneries along all along the Fraser before the salmon stocks started to decline in 1913 from to a landslide at Hell’s Gate due to lazy CPR railroad engineering. But going back Cannery Row Cafe, I actually attended its grand opening. I was either 3 or 4 (I’m banking on 4), so I’d say this photo was taken in or after 1984. Actually, based on the construction of the building on the other side of Second Avenue, I’d date this photo 1987 or 1988, even though the photo archives date this as “early 1980s”. I forgot until I saw this photo that local artists would set up shop outside, selling their paintings. Sometimes bands, including my Uncle Terry’s (who drummed), would play in the empty lot next door. In 1995 as a high school student, I started to work here in the summer; my first-ever job. I bussed tables, cleaned dishes, made sandwiches, made cappuccinos and lattes, served muffins, pies, and hot entrees. I even sometimes cooked! I also never got a tip and was paid minimum wage the entire time. I doubt times have changed. Such is the life at a cafe. I’m not complaining mind you, I have some very fond memories, and I still to this day have dreams where I’m back at the cafe scrubbing egg yolks off plates and wrestling with the industrial dishwasher. Today the cafe is known as Steveston Cannery Cafe. The name change happened out of legal issues rather than desire. In the late 80s (or possibly early 90s), my uncle was threatened with a lawsuit from The Cannery, a now-defunct gourmet seafood restaurant in Vancouver. They thought the name was too similar and figured they were losing business if people were scanning phone books (remember those?) and were mistaking Cannery Row Cafe for The Cannery. My uncle changed the name to the Steveston Cannery Cafe and the name has been the same ever since. In fact, very little has changed since it first opened. The menu, the interior decor, the furniture, the service style – it’s still 1984 at the Steveston Cannery Cafe. Really interesting stuff! And always so cool to see a family connection in historic photos. You’re Uncle Ray is friend. Used to run the water-taxi with him. Live o Salt Spring Island these days but used to live on my boat the Tyee No.1. I loved Steveston then. So many changes. Thanks for this blog and the memories. p.s Had my first espresso ever on that machine you spoke of. One had to pull a lever to get your run.lol. Many hours spent there. I lived in Steveston in the 1940’s and have a few pics and lots of great memories.